Here at Running River Rug Cleaning we receive hundreds of testimonials a year from fine folks who appreciate our craftsmanship, knowledge and experience. Doug is a one of a kind man. We wouldn’t trust our $20,000 rugs with anyone else. You won’t find someone with Doug’s level of experience to clean or sell you an investment quality textile. He is also a great teacher, 30 minutes with Doug will open your mind to the rug industry on a whole new level. He’s even good enough to pinpoint almost ever region your rug was made. Outstanding performance and quality of work. I highly recommend you give these guys a call today. Garrett owns Steam Team Tile & Grout Cleaning out of California and has trained under Doug to learn the art of rug cleaning and restoration. And although Running River does receive rugs from all over the country to clean and restore, most of our customers come from the New York area. When you need your antique and precious rugs cleaned and restored call Running River Rug Cleaning at (631) 730-5511 to schedule a pickup. Just wanted to stop by and share with you some cool rug news. 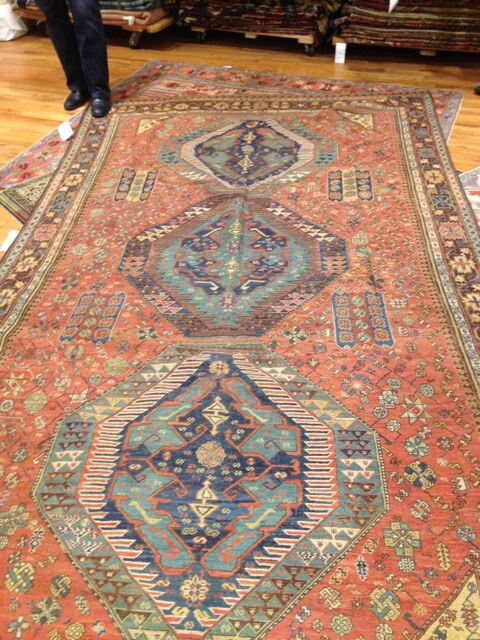 We are very pleased to add this antique Dosemealti rug to our personal collection at Running River Rug Cleaning. We not only clean and restore woven art from around the world . I take great pride in our personal collection of antique and vintage rugs . This rug is a true Turkish treasure . When you’re ready to have your precious rug treasures cleaned and restored call Running River Rug Cleaning today at (631) 730-5511. We’re located in Medford NY but we service these fine areas: Manhattan, Westchester, Brooklyn, Rockland, Queens, New Jersey, Nassau, Connecticut & Suffolk. 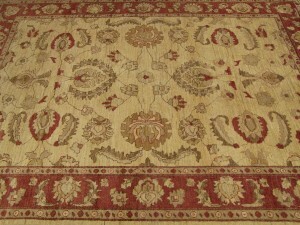 When our clients enter our Medford NY rug plant they immediately realize their woven treasures are in competent hands. They see we share our clients passion for woven art. John Long is the proprietor of Running River and are very serious collectors. 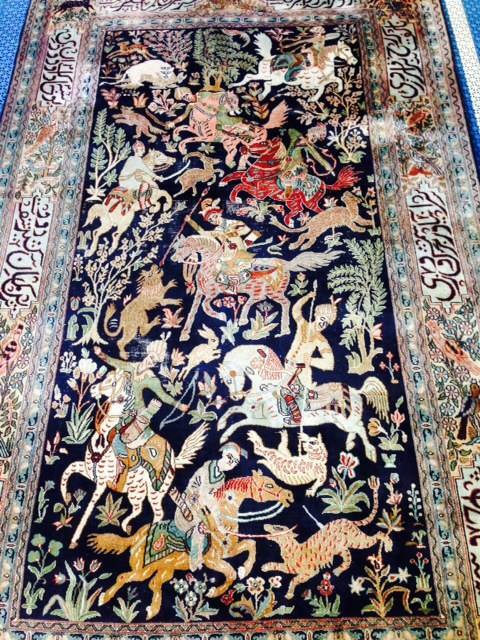 Restoring and cleaning antique and vintage rugs from around the world is our expertise. John who is a Certified Master Textile Cleaner guarantees our clients satisfaction with our superior craftsmanship. Running River Rug Cleaners are Wool safe authorized service providers and have FCITS certified inspectors on staff. Meet the worlds greatest rug dog Magnus. He is our mascot at Running River Rug Cleaning. Magnus is very special. Loves woven art. Place three antique rugs on the floor and Magnus will immediately tell you which one has the finest wool. 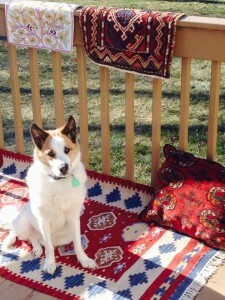 He has experience with antique and vintage rugs since he was a pup. Magnus is now 12 years old. In the picture Magnus is with a few woven treasures from his personal collection. Magnus and team Running River personally guarantee our clients satisfaction with our craftsmanship. Restoring woven art is our passion. Magnus is one serious collector and the worlds greatest rug dog. He loves his new Kozak rug that he purchased to add to his extensive collection of woven art. He is a great loyal companion. Very special! At Running River rug cleaning we see so many rugs. Each with it’s own pattern. The most common pattern is a central medallion with a lesser pattern on the borders. Some say the medallion is like the mandalas of Buddhist theory that offer the owner some means of spiritual protection. Mandala (Sanskrit Maṇḍala, ‘circle’) is a spiritual and ritual symbol in Indian religions, representing the universe. The basic form of most mandalas is a square with four gates containing a circle with a center point. Each gate is in the general shape of a T. Mandalas often exhibiting radial balance. The term appears in the Rigveda as the name of the sections of the work, but is also used in other religions and philosophies, particularly Buddhism. In various spiritu al traditions, mandalas may be employed for focusing attention of practitioners and adepts, as a spiritual guidance tool, for establishing a sacred space, and as an aid to meditation and trance induction. In common use, mandala has become a generic term for any diagram, chart or geometric pattern that represents the cosmos metaphysically or symbolically; a microcosm of the universe. 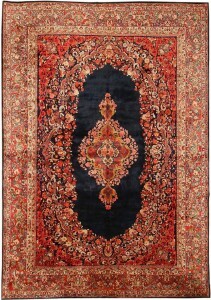 Medallions are the common motif for Persian rugs. Yet, even if two carpets have basically the same design, no two medallions are ever exactly the same. Some experts believe that the medallion designs stems from the very religious nature of the weavers and that their inspiration probably came from the artwork and patterns of domes of the mosques. One typical Oriental rug design uses a medallion, a symmetrical pattern occupying the center of the field. Parts of the medallion, or similar, corresponding designs, are repeated at the four corners of the field. 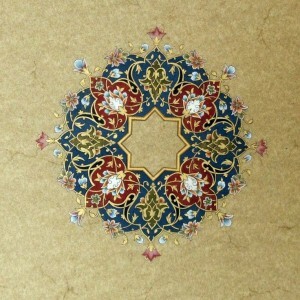 The common “Lechek Torūnj” (medallion and corner) design was developed in Persia for book covers and ornamental book illuminations in the fifteenth century. In the sixteenth century, it was integrated into carpet designs. More than one medallion may be used, and these may be arranged at intervals over the field in different sizes and shapes. The field of a rug may also be broken up into different rectangular, square, diamond or lozenge shaped compartments, which in turn can be arranged in rows, or diagonally. In Persian rugs, the medallion represents the primary pattern, and the infinite repeat of the field appears subordinated, creating an impression of the medallion “floating” on the field. Anatolian rugs often use the infinite repeat as the primary pattern, and integrate the medallion as secondary, Rug design can also be described by how the surface of the rug is arranged and organized. One single, basic design may cover the entire field (“all-over design”). When the end of the field is reached, patterns may be cut off intentionally, thus creating the impression that they continue beyond the borders of the rug. This feature is characteristic for Islamic design: In the Islamic tradition, depicting animals or humans isprohibited even in a profane context, as Islam does not distinguish between religious and profane life. Since the codification of the Quran byUthman Ibn Affan in 651 AD/19 AH and theUmayyad Abd al-Malik ibn Marwan reforms,Islamic art has focused on writing and ornament. The main fields of Islamic rugs are frequently filled with redundant, interwoven ornaments in a manner called “infinite repeat”, The Medallions represent the awakening. The attraction of tribal style designs is the intricate receptive nature of most design motifs. Usually, formal carpets are graphed onto paper so that weavers could replicate the intricate motifs. 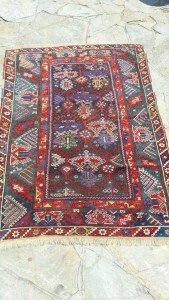 In the tribal style rug, repeating motifs and are repeated in combinations. Weavers were able to memorize the motifs that made up their tribes visual nomenclature. And they were able to produce their rugs without the aid o f graphs of samplers. Individuality was expressed in small ways. The overall design scheme and color combinations of tribal rugs is fairly consistent except for those wonderful unique accents. What is an authentic tribal style rug? Is it a rug that is with vegetable dyes exclusively made? Is it a rug that predates influence from western markets? Or is it a rug that maintains a certain level of design integrity, using the patterns form the tribe? Ideally each individual rug should be judged on its own merits. The 1980s saw the raise of the natural dye renaissance in hand knotted rugs. Rug producers started experimenting successfully with reviving the natural dye recipes to unlock the secrets of these radiant colors and were not only interested in great color but they were also interested in great design. And don’t take these rugs for granted! Fewer and fewer people are interested in weaving rugs today. Younger generations in Persia, Turkey, India, Afghanistan and elsewhere are no longer going into the skilled craft of weaving. Maybe, in as few as 20 years from now, hand woven rug maybe be extinct! It is my honor to be able to care for these incredible rugs today at Running River Rug Cleaning. At Running River, we are honored to care for the finest rugs. Today I would like to share some information about some fine beauties, the carpets from Nain. Nain (Persian: نائين, also Romanized as Nā’īn and Nāeyn) is a city in and the capital of Nain County, Isfahan Province, Iran. At the 2006 census, its population was 24,424, in 6,950 families. Na’in (also known as Naein and Naeen) lies 170 km north of Yazd and 140 km east of Esfahan with an area of almost 35,000 km², Na’in lies at an altitude of 1545 m above sea level. Like much of the Iranian plateau, it has a desert climate, with a maximum temperature of 41°C in summer, and a minimum of -9°C in winter. More than 3,000 years ago the Persians learned how to construct aqueducts underground (qanat in Persianکاریز, or kariz) to bring water from the mountains to the plains. In the 1960s this ancient system provided more than 70 percent of the water used in Iran and Na’in is one of the best places in all the world to see these qanats functioning. Unique to Na’in are some of the most outstanding monuments in all of Iran: the Jame Mosque, one of the first four mosques built in Iran after the Arab invasion; the Pre-Islamic Narej Fortress; a Pirnia traditional house; the Old Bazaar; Rigareh, a qanat-based watermill; and a Zurkhaneh (a place for traditional sport). Besides its magnificent monuments, Na’in is also famous for high-quality carpets and wool textiles .Some linguists believe the word Na’in may have been derived from the name of one of the descendants of the prophet Noah, who was called “Naen”. Many local people speak an ancient Pahlavi Sasani dialect, the same dialect that is spoken by the Zoroastrians in Yazd today. Other linguists state that the word Na’in is derived from the word “Nei” (“straw” in English) which is a marshy plant.It has one of the earliest remaining mosques in Iran, and has a Sassanid era fort, now in ruins, called Narin Ghal’eh.It extensively uses ab anbars. Naein is most famous in the world for its rugs. Running River Rug Cleaners® know how to clean it all. So many of you come to us to ask about your Karistan and of course we are excited to tell you what we know! The Karastan ‘Wonder Rug’ wowed tens of thousands of visitors at two World’s Fairs. Consumers at that time quickly learned that the Karastan name means quality, beauty, and durability. In a North Carolina mill during the 1920’s, Marshall Field & Co. created an exciting and innovative product – machine-made oriental design rugs of high quality at realistic prices. They played a big part in introducing American households to the very concept of walking in comfort, we provided the impetus for mass appeal by introducing yet another innovation in 1948: our Kara-Loc® method of weaving. Much like hand knotted as they are tightly woven, why? Pressure washing the cotton foundation makes it shrink and cling to the wool knots. Initially limited to the production of plain velvet and twist styles, Kara-loc eventually produced an explosion of fashion innovations, including multi-colored designs, along with cut-and-loop effects at least 15 years ahead of the rest of the industry. The innovative method made possible the production of high-styled, quality carpets at prices affordable to average consumers. The year American retailer and textile manufacturer Marshall Field built a loom capable of recreating the detailed craftsmanship of a hand-woven rug. From the moment the first Karastan came off the loom (2:02 p.m., April 8, 1928), our name became synonymous with elegant machine-made rugs that rivaled their handmade counterparts. So far advanced was the new manufacturing process that the trade press referred to our rugs as “Mystery Rugs.” To share the “mystery” of these rugs with the public, Karastan created a large version of its Kerman pattern for the 1933-34 World’s Fairs in Chicago. The Karistan Kerman named after Kerman, which is both a city and a province located in south central Iran, Kerman has been a major center for the production of high quality carpets since at least the 15th century. In the 18th century, some authors considered the carpets from the province of Kerman, especially at Siftan, to be the finest of all Persian carpets partly because of the high quality of the wool from the region known as Carmania wool. Kerman rugs are prized by collectors for a myriad of reasons, which includes but it not limited to: a wide range of designs, a broad pallet, utilization of natural dyes and fibers, immense tensile strength and abrasion resistance, and expert color combinations. No two Kerman rugs are precisely alike, but these general characteristics typify this enduringly popular style. Instead of putting it on display so visitors could simply admire its beauty, Karastan did the unthinkable. They invited the world to walk on it. And so the world did. More than 5 million people left their footprints, spills and ground-in food stains all over the rug. Then it was time for cleanup. We cleaned half the rug so people could see how well our rugs recover. The rug still exists in the same state today—one side almost unrecognizably filthy, the other returned to its original beauty and luster.To prove that the demonstration was no fluke, we did it again. This time more than 9 million visitors walked on our rugs at the New York World’s Trade Fair of 1939-40. 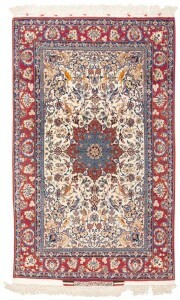 It’s no wonder our rugs became known as “The Wonder Rugs of America.(karastan.com). Let us clean your Karistan! Isfahan, or as the Iranians name it, Nesf-e Jahan (half of the world), is the masterpiece of Iranian art and architecture and it is one of the most wonderful cities in the Islamic world. Isfahan is located at the crossroads of the major north-south routes of Iran, and once this city was considered as one of the greatest cities in the world. In the 16th century, in the Safavid era, Isfahan was chosen as the capital of Persia, and the city experienced a rare glory.The Iranian city of Isfahan (also spelt Esfahan) has long been one of the centers for production of the famous Persian carpet (or rug). 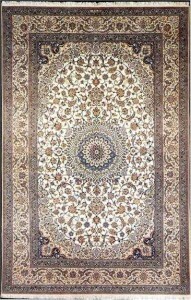 Isfahani carpets are known for their high quality. The most famous workshop in Isfahan is Seirafian. So many of the best Persian designs are timeless classics. One of my favorites is a Sarouk. Sarouk Rug is a type of Persian rug from Markazi Province in Iran. Sarouk (also Saruk or Sarough) rugs are those woven in the village of Saruk and also the city of Arak, Iran and the surrounding countryside. Sarouk rugs have been produced for much of the last century. The early successes of the Sarouk rug are largely owed to the American market. From the 1910s to 1950s, the “American Sarouk” also known as the “Painted Sarouk” was produced. American customers had an affinity for the Sarouk’s curvilinear and floral designs. What they did not appreciate, however, was the color, so for much of the 1920s, 30s and 40s, rugs exported from Iran would get a dye job to a desirable, deep, raspberry-red color, once they made it to the States. Sarouk rugs continue to be produced today, using the same methods as during early production – with the exception of the post-production dye job. Known for their exceptional quality and ability to withstand decades of wear, Sarouks continue to be a best seller of the Persian rugs. They are made with a high quality, tough wool using a Persian knot. A tell tale sign of a Sarouk is usually its blue weft threads, salmon or tomato-red color mixed with ivory and blues, and a very traditional, floral style. The finest of the modern Sarouk rugs comes from the small town of Ghiassabad. What do you know about the Peshawar rugs? In the most simple way they can be described as: hand knotted wool, new from Pakistan, top of the line floral Oushak designs taken from rugs from the Ottoman Empire, recreated in fashionable updated colors for the American market, golden and tan. Peshawar (Peshavar) rugs and carpets are sometimes also referred to as chobi rugs, which a loose translation means “of wood” or of natural colors. The Peshawar style is highly characterized by a thinly sheered pile, large print designs, and most predominant, their antique ivory and sometimes golden tones. It is fairly unusual for a Peshawar carpet to have more than 8 distinct colors, and the general overtone has a “washed-out” or sometimes even faded appearance. Speaking of washing, remember they are an organic fiber that needs a knowing touch. 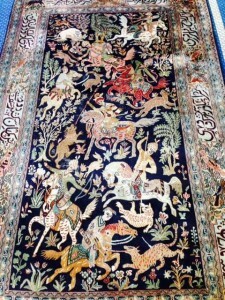 A Tabriz rug widely recognized as a type in the general category of Azerbaijan carpets / Iranian carpets from the city of Tabriz, the capital city of East Azarbaijan Province in north west of Iran totally populated by Azerbaijanis. It is one of the oldest rug weaving centers and makes a huge diversity of types of carpets, Tabriz has been a large and worldwide famous carpet making center in the Iran and the world. It played a significant role in development the rich traditions of the decorative and applied arts. The art of Tabriz carpet have been recognized as early as the 12th-16th centuries. Today still their appealing patterns characterized by a harmonic merge of the arts of miniature paintings and weaving, by a high level of craftsmanship demonstrated by artists and carpet weavers. One of the most wonderful Persian tribal designs is the Bahktiari rug. To get a better idea of how to clean them, I spent some time learning and understanding their nature first. They are renowned for their exquisite vegetable dyed brilliant colors. So come with me for a moment on a little in depth trip to their region so we can better understand them and their rugs! The Bakhtiari are southwestern Persian tribe, and a subgroup of the Lurs. They speak the Bakhtiari dialect, belonging to the Lurish language. Bakhtiaris primarily inhabit Chahar Mahaal and Bakhtiari and eastern Khuzestan, Lorestan, Bushehr, and Isfahan as well as Khuzestan. Some Bakhtiari are still nomadic pastoralists, migrating between summer quarters (sardsīr or yaylāq) and winter quarters (garmsīr or qishlāq). Numerical estimates of their total population vary widely. The term “bakhtiari” can be best translated as “companion of chance” or “bearer of good luck”. The term has deep Persian roots and is the result of two smaller words “bakht” and “yar” complied together. “Bakht” is the Persian word for “chance” and “yar”, “iar”, “iari” literally means “companion”. The latter designation largely relates to the nature of the tribe’s annual “migration”. This has to do with the harsh nature of Bakhtiari life and overcoming of countless difficulties that Bakhtiaris have faced in the Zagros ranges. In this sense, Bakhtiaris view themselves as a hardworking tribe, facing numerous obstacles every day and yet fortunate enough to overcome each of these challenges as a solid unit. With the expansion of Bakhtiari influence, urban elites (particularly in Tehran) began to worry in regards to a potential Bakhtiari takeover of Persia’s affairs. Prior to this point, the Bakhtiari had largely remained within their own territorial boundaries. The Bakhtiari influence would continue to play an important role within the early 20th century politics of Iran. The Bakhtiari people are mainly from two tribal divisions, Chahar lang (English: Four Legs) and Haft Lang (English: Seven Legs). Due to the harsh nature of their life style, Bakhtiaris have been able to keep their blood lines intact, largely marrying within their own tribe. The famous documentary: “Grass: A Nation’s Battle for Life” (1925) tells the story of the migration of Bakhtiari tribe from winter quarters in Khuzestan to summer quarters Chahar Mahaal. This film also tells the story of how these people crossed the river Karun with 50,000 people and 500,000 animals. The documentary “People of the Wind” (1975) retraces this same journey, 50 years later. The British documentary series “The Ascent of Man” (1973) in the first part of its second episode, “The Harvest of the Seasons,” also shows the Bakhtiari making the annual migration to the summer pastures. This portrayal is not however, particularly positive, using the Bakhtiari as an example of a pre-agricultural tribe frozen in time. As of 2006, the migration still takes place, although the livestock are now transported in trucks, and the shepherds no longer walk barefoot in the snow between provinces. Traditionally producing only geometric designs, the Bakhtiaris—along with the Armenian, Kurdish and other weavers of the Chahar Mahal—were also influenced by the floral carpets of the Persian cities, especially those of nearby Isfahan. This gave birth to an innovative and distinctive stylization. This is found especially in their oversize and palace-size antique Bakhtiatri carpets that were woven on commission by the great Bakhtiari khans. 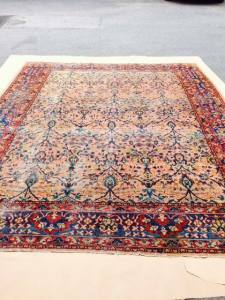 These are among the most highly regarded of the antique Bakhtiari carpets. Until the 1930’s Bakhtiari rugs were characteristically woven for use by the tribe or on commission within Persia. As they were rarely produced to be exported, they offer lanolin-rich, extremely durable wool and luminous colors, which were procured through a thorough knowledge of dyeing, using natural dyestuffs. The oversized Bakhtiari carpets represent the endeavors of a group of highly skilled weavers working years together the level of harmony and balance they achieve in their best antique rugs, not to mention their truly inspiring artistry, is incredible. I love my time in the wilderness, so I suppose that’s why I find the hunting patterned rugs so appealing. Most likely to be seen in Persian wools but it also has a great following in silk. There are three major kinds of knotted rugs: Bokhara, Persian and Tribal (Baluchi, Beljik, Chobi, Gabbeh, Heriz, Kazak, Khal-Mahaamdi, Shairwan, Qashqai). Chobi rugs were a response to the North American fashion taste that intended to modify the boldness of the traditional rugs in order to give a muted and antique look of natural wood color that was desired by modern fashion industry. The Beljik is noteworthy because of rich colors and the rugs are generally considered to be the finest of all tribal style rugs. They are made with finely-spun wool and knotted into intricate geometric patterns with complex borders. With the wool for these carpets is only taken from the belly of the sheep, it increases the number of sheep required to produce this wool and therefore the price of this wool. The dyes used in Beljiks are commercially-produced. Beljiks sometimes have needlework detailing along their fringe and bound edges, adding to the overall intricacy of the carpet. 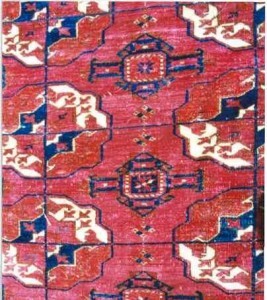 The other most popular rug from Pakistan (other than the abundant Bukhara), Kazaks are known for their indigo blues, reds and ivories, and their informal appearance. Kazak rugs are almost entirely naturally-dyed, however, Kazak natural dyes are commercially farmed natural dyes (such as indigo and cochineal) and are therefore less labor intensive for than harvesting in nature. By the end of the 19th century the textile industry was experiencing tremendous growth which fostered a need to develop faster and more economical rug dyeing processes to keep up with the demand for increased production. 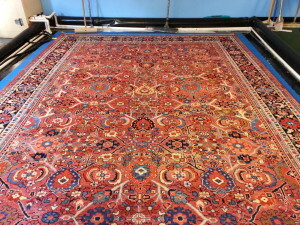 Until this time rugs were dyed using natural materials such as root madder and insect shells. Aniline was the first synthetic dye dated around 1826 developed by a German chemist Otto Unverdorben. Many early developed synthetics used in rug dyeing were not successful and caused a multitude of problems such as bleeding when exposed to water, fading and color change. Over time synthetic dyes improved. Using technology to create synthetic dyes offered the ability to create hundreds of different shades of color that even experts find challenging to distinguish from natural dyes. Today to verify the authenticity of antique rugs from a dye perspective, liquid chromatography and photoelectron spectroscopy can be utilized to make the distinction. Identifying the presence of synthetic dyes in rugs can be used to help determine age. Antique and semi-antique rugs are dyed primarily with natural materials; however there are older rugs that may have the presence of a few synthetic dyes. The dyes used in the rug making process are crucial in classifying a rug as collectible woven art or primary purpose is decorative. I learned a great deal about dyes from noted authority Manfred Bieber. John Collins has also enlightened me as to the importance of natural dyes to qualify a rug as woven art. 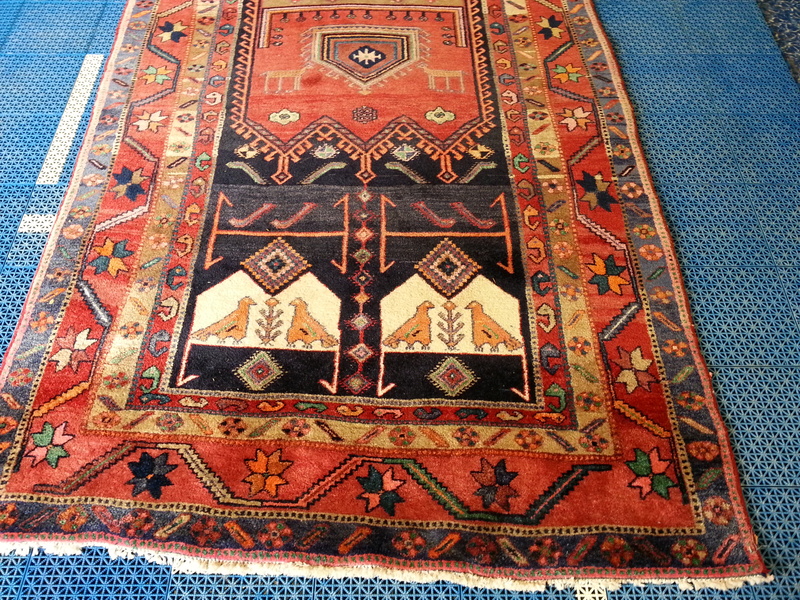 Kurdish rugs are well known for their beauty, craftsmanship and durable construction. Kurdish weavers are Middle Eastern Iranians spread geographically through parts of Iran, Iraq, Syria and Turkey known collectively as the geo-cultural region of Kurdistan. The art of rug weaving for the Kurdish peoples is an ancient tradition passed on from generation to generation. The use of a symmetrical knot combined with a wool foundation enables these quality treasures to last for years and years. 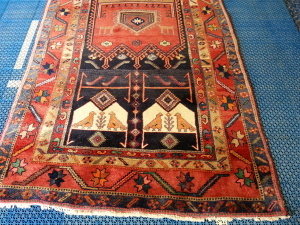 Kurdish rugs are known to exhibit extensive use of geometric patterns and floral motifs. The use of vivid colors particularly blues and oranges really make for a visual masterpiece and exceptional works of art . The technicians at Running River Rug Cleaning have the education and expertise to provide superior care and cleaning of your Kurdish work of art. Turkey and the region of Anatolia are recognized for its tradition of crafting kilims or “flat woven rugs” of outstanding quality and geometric designs. 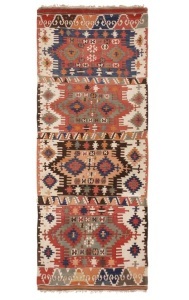 The origins of Turkish kilims date back thousands of years. In the late 13th century the Venetian explorer Marco Polo wrote about the “beautiful rugs of Konya and Karaman”, two cities in the Anatolian region he had traveled. Turkey is noted to be an area where collectors seek out the finest kilims in the world woven by artisans that have continued the tradition for hundreds of generations. Kilim rugs are true works of art. They are sought after for both function and decorative purposes. The interest in kilims has increased by rug purveyors and homeowners alike in more recent years due to the beauty of their colors and geometric designs and reasonable prices. When purchasing kilims one must consider factors such as how the rug was made, where the rug was made and by whom the rug was made. The process of purchasing a good quality kilim that fits your personal style and function can be overwhelming. 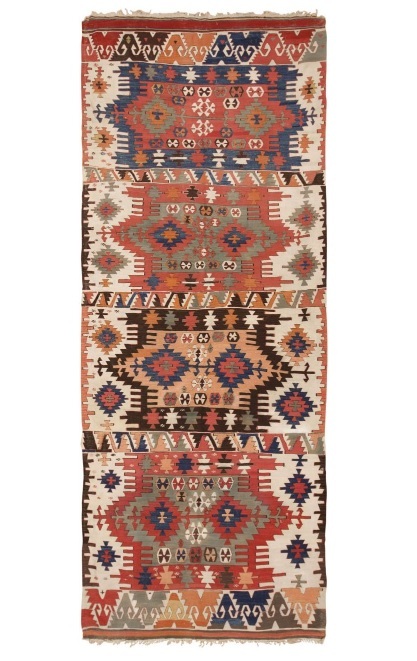 My personal attraction to kilim rugs specifically from the Anatolia region is the incredible saturated vivid colors combined with geometric art that lends itself to a mystical quality. Running River has resource to some of the finest kilim purveyors in the world and can help guide you in your search for unique hand woven kilims from Turkey. Whether you are looking to purchase that perfect kilim to add to an existing rug collection or want to purchase to decorate your home or office Running River is available to guide you. Call Running River at (631) 730-5511 for additional information or visit our website www.runningriverugcleaning.com. Running River has had the opportunity to clean and care for many collectible Navajo works of art. 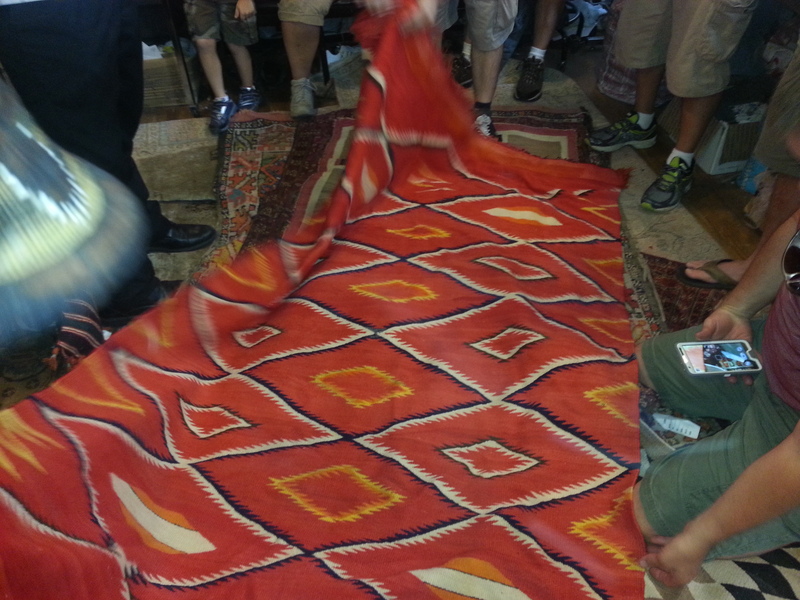 Navajo rugs and especially Navajo blankets are highly valued and well sought after by collectors. The Navajo settled in the Southwest and were greatly influenced by the Pueblo people who introduced the use of cotton, wool and upright looms for weaving. Early Navajo weavers developed a reputation of weaving and trading durable utilitarian blankets and serapes, long blanket-like shawls. Distinct geometric patterns found in Navajo blankets and rugs relay the culture and history of the Navajo people. Navajo rugs and blankets are becoming more and more desirable. The value of Navajo textiles increase dramatically with age depicting the history and culture of a people who greatly influenced early American history. If you are fortunate enough to own a Navajo rug or two you can truly appreciate the design, colors and complexity of these fine textiles. Running River Rug Cleaning, IICRC Master Textile Cleaners and WoolSafe Authorized Service Provider, has the education and experience to clean and gently care for your investment quality Navajo treasure. Traditionally Tibetan rugs are made from Tibetan highland sheep wool. Highland grasslands provide ultra-nourishment for the sheep lending to high quality wool. Quality weaving using highland sheep virgin wool involves hand carding the wool and knotting and spinning by hand. The Tibet knotting method is unique and different from those techniques typically used in making oriental and other rugs found worldwide. Tibetan rugs made from highland sheep wool are known for simple elegance and a soft, plush texture. 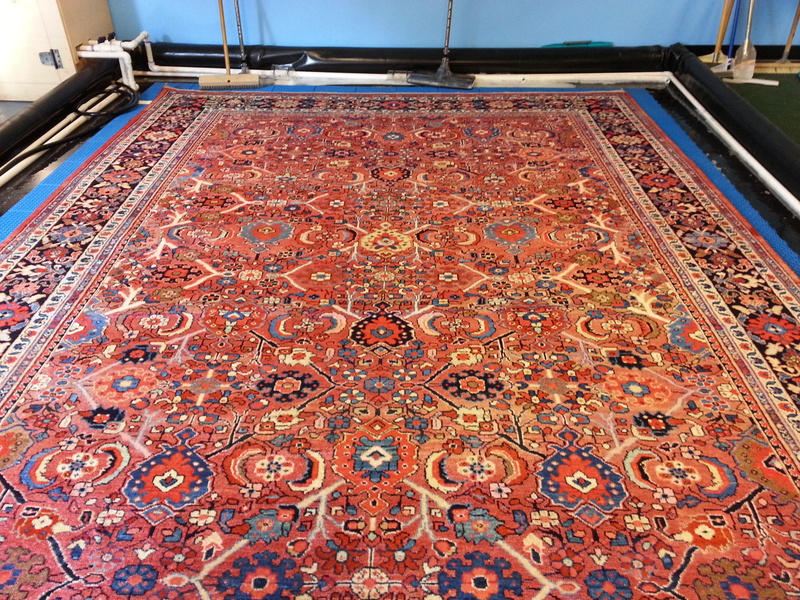 For the past 25 years I have had the honor and pleasure of cleaning some of the finest rugs in the world. I have found that the wool used in making Tibetan rugs combined with a unique weaving technique is a winning combination. 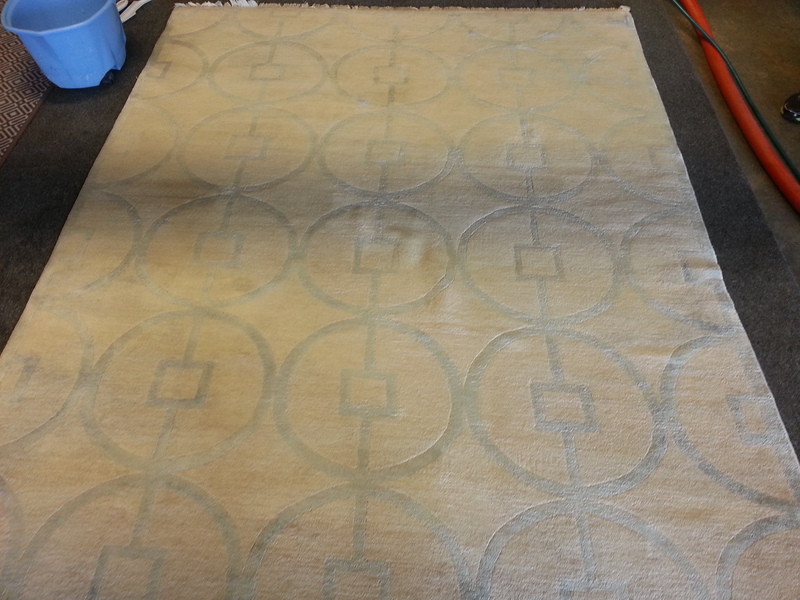 Running River Rug Cleaning’s master textile technicians have extensive solid experience cleaning wool and silk rugs. Pictured is a beautiful Tibetan wool and silk rug that had a large pet urine stain; Running River cleaned and restored this beautiful rug to like new condition! Running River Rug Cleaning is an authorized WoolSafe Service Provider. Running River Rug Cleaning is located on Long Island, NY servicing the New York tri-state area. Our specialty is cleaning investment quality rugs. 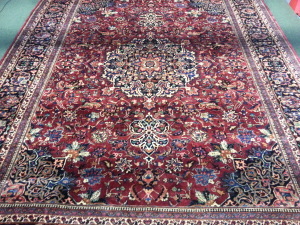 Many of the rugs we clean come from Persia, today’s Iran. Iran’s top master weavers hail from ancient Isfahan, one of Iran’s largest cities. Iran is home to weavers of some of the finest rugs in the world. Weaving is passed down through families for many generations. Antique rug collectors will tell you Persian rugs are highly prized and noted for their rich saturated colors and elegant designs combined with superior craftsmanship. 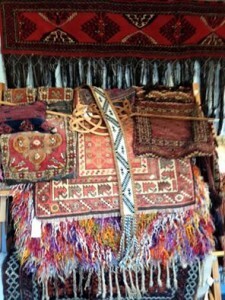 Running River has its own collection of Persian rugs in addition to having the honor to clean these woven treasures. When it comes to investment grade woven or machine made rugs, what one person considers a true woven treasure or high quality machine made rug another person would choose not to purchase. Being around quality woven rugs can be addicting similar to collecting art work. 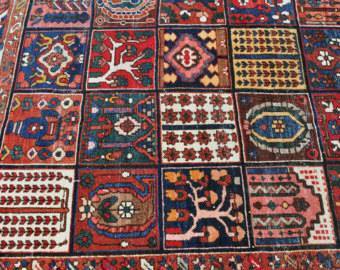 One collector may like Persian rugs while another may purchase only kilim or tribal rugs from a specific region or family of weavers. When purchasing rugs many factors should be taken into consideration in addition to personal preference for color, design, and construction. A high quality wool rug will be constructed of high quality wool. Quality wool has exceptional crimp or bulk, will be very soft and stand up to years of use. Quality wool accepts dyes more efficiently and adds to the value of the rug. Hand spun wool is also desirable. 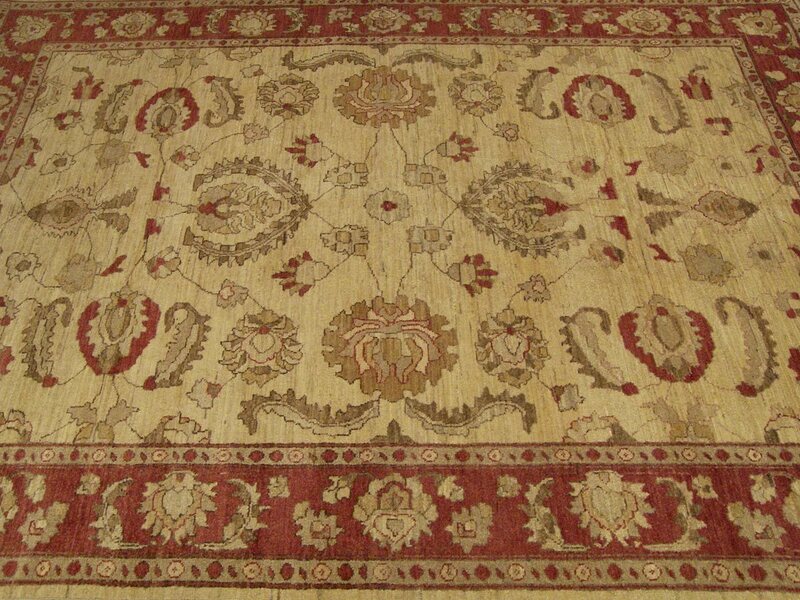 KPSI or knots per square inch in a well-made rug is a major factor to the life of a rug. Finely woven rugs or rugs with a high knot count have a longer life, add to the overall beauty and have a unique appearance. The dye method used is another factor that separates a mediocre rug from a real woven treasure that would use only natural dyes. 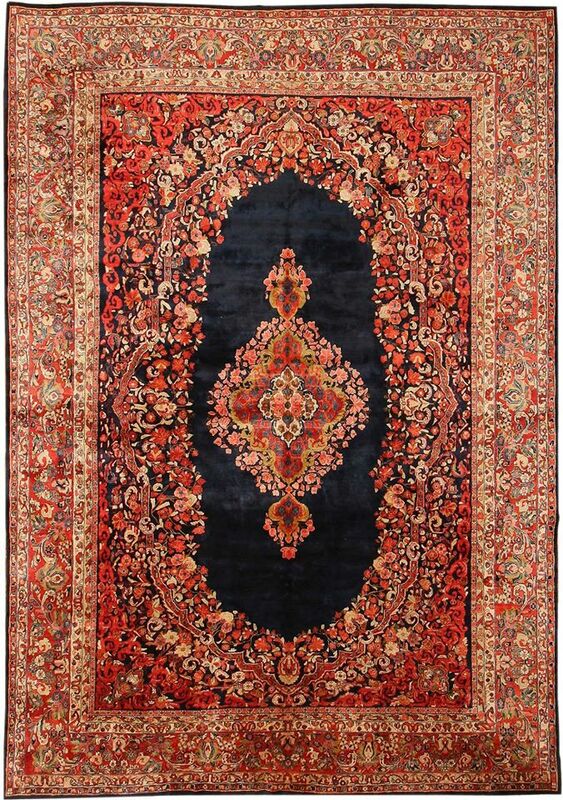 Older rugs in good condition with high knot counts coupled with natural dyes like this Persian Sarouk from the early 1900s would be considered collectible to many who love rugs. A rug’s finish is also important; many rugs undergo a specialized process of washing when being made using different amounts of bleach to create visual effects to the rug such as a high shine. When purchasing rugs, consider the factors discussed above but most importantly choose a rug that you love, perhaps something that is unique and that you may keep in your family to pass on to future generations. Woven treasures will bring long lasting beauty and enchantment to your home, office and life. Running River takes great pride in using clean and healthy water to wash our client’s investment quality rugs. Clients comment often on how bright the colors appear after cleaning in addition to softness and shine to the wool. To clean investment grade textiles and achieve the ultimate results it all starts with the quality of water a rug plant uses in the cleaning process. Running River owners Doug Heiferman and John Long have a combined 55 years of experience in the field of textile maintenance specializing in investment quality and antique rugs. Doug’s background as an Industry Consultant and Trainer enable Running River to bring a unique perspective by employing advanced water purification in order to deliver the ultimate cleaning of your fine woven rug. Running River has a water purification system to remove chemicals and other particulates from the water used in our cleaning process. The system reduces any chlorine, salt, iron, fluoride, aluminum and calcium commonly found in water. The system also has the added feature of being able to add chemical free disinfection to the water which is a safeguard to eliminating any harmful microorganisms during the cleaning process. Running River believes in providing a cleaner clean while limiting our environmental footprint. When your woven treasure is cleaned by Running River’s IICRC Master Textile Cleaners and WoolSafe Authorized Service Provider, the results are that your rug is cleaner and healthier and the process removes contaminants and residues which translate to a vibrant work of art that will last for many years to come. In this situation which most pet owners encounter at one time or another, the key is to absorb as much of the pet urine from your rug immediately using a couple of colorfast white absorbent cotton towels. It is always a good idea to keep a few small cotton towels handy for this purpose. First, fold one cotton towel into layers and place over the urine affected area. Put pressure on the cotton towel to absorb as much as you can from the top of the rug; blot do not rub or scrub! Duplicate this procedure several times using clean portions of towel. If deposit is heavy place another cotton towel underneath the rug at same time as absorbing from top surface. Repeat the process until the urine is absorbed from the affected area. To tackle urine staining, it is critical to avoid applying over the counter spotters with a high alkaline pH, bleaching agents or oxidizers that may affect the dyes in your rug in a negative way leading to permanent color changes. The best approach is to blot the affected area with club soda using another absorbent white cotton towel; do not rub or scrub the area this may damage the fibers of your rug. The goal here is to help minimize any immediate damage that may occur to your rug and should be followed up with thorough submersion cleaning from your professional rug cleaning company. Pets will mark their territory and repetitive accidents left without professional cleaning lead to staining, color loss, pet urine odor and over time the foundation of the rug can dry rot. Call Running River Rug Cleaning and we will gladly answer your questions about pet related problems! 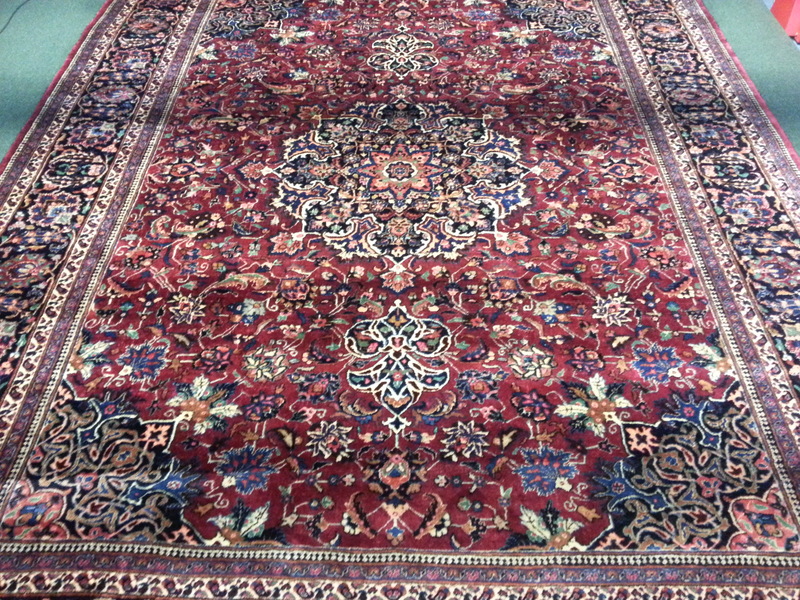 When it comes to cleaning Oriental rug and specialty area rugs (i.e., Persian, silk, Navajo, Tribal, antique, etc.) there is little to no regulation that a company must acquire specialized training or proper certification to clean rugs. Before hiring a company to clean and care for your woven treasure it is important to take the time to research and get background information on companies in your area. You want to look for a company that specializes in rug cleaning, has a dedicated facility, has sufficient years of experience, employs highly trained and certified technicians and are active members of industry trade associations and organizations. Running River Rug Cleaning is owned by John Long is an IICRC Certified Master Textile Cleaner, Certified Mold Removal Specialist and has over 30 years of hands-on experience in the field. He has cleaned rugs from around the world in some of the finest homes and businesses from Manhattan to the Hamptons and Tri-State Area. John also specializes in water damage restoration. In addition to years of experience and numerous educational certifications, Running River is a WoolSafe Approved Authorized Service Provider (www.woolsafe.org/usa) in the New York Tri-State Area and member of New York Rug Cleaners Institute. Running River’s IICRC Certified Master Textile Cleaners have a combined 55 years experience cleaning some of the finest rugs in the world. When it’s time to clean your valued rugs be assured Running River Rug Cleaning has the proper education through certification to ensure quality work. Oriental rugs are truly works of art. While these works of art are primarily situated on the floors of homes and offices their beauty can last for decades if maintained properly. Abrasive soils can cause damage to the face pile yarns and foundation of the rug. To avoid damaging soil from becoming lodged in the foundation, rugs must be vacuumed on a regular basis. Vacuums with beater bar attachments are not the best for wool since wool is a short staple fiber. Instead use a quality vacuum with a suction attachment. In addition, take special care when it comes to fringe on your area rug. Avoid placing a vacuum’s beater bar on fringe which can tangle, tear and basically chew up fringe. While vacuuming on a regular basis is imperative, it is highly recommended to send your area rug out periodically for professional cleaning and dusting equipment made to remove those damaging soils from deep within the foundation of the rug. Following these tips will help to maintain the longevity and beauty of your wool area rug. We love our pets, but we don’t love the damage they can sometimes do to our beautiful woven treasures. Pet urine can be a major problem for wool rugs, reasons being the construction type and ability to absorb moisture. 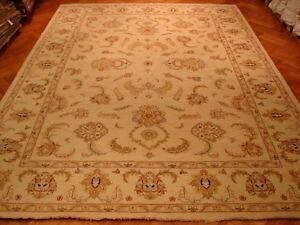 Urine travels to the foundation of rugs and undergoes a chemical change from an acid to alkali (high on the pH scale). Alkali damages wool and other natural fibers and has a detrimental affect by weakening dyes in the rug. The uric acid breaks down into ammonia and forms into salt crystals. These salt crystals attract moisture creating an environment for bacteria to flourish and creating that obnoxious ammonia based odor. Pet urine left unattended can cause permanent color loss and stain your rug. Unfortunately color loss cannot be corrected by cleaning. To preserve your rugs be certain to address pet accidents immediately. Prevent as much urine as possible from sinking to the back of the rug by gently blotting the urine contaminated area with an absorbent white cotton towel. To prevent damage to your rug pet urine must be removed completely. Depending on the situation, the best bet when it comes to urine decontamination is to call a professional rug cleaning company such as Running River Rug Cleaning to save your rug. Running River Rug Cleaning’s urine decontamination process removes pet urine from the foundation thoroughly flushing and sanitizing to prevent permanent damage and eliminate that yucky pet urine odor. Rest assured Running River has the ability through years of experience and education to resolve pet urine problems. Contact us we are always happy to help save a rug and restore the beauty and elegance to your woven treasure! The team of Running River are passionate, trusted and proficient rug cleaners. You can tell they are sincere rug lovers that treat your textile with the utmost care. I highly recommend them! Running River Rug Cleaning is the best of the best. They’re the company that trained me, as well as a lot of others, in the art of fine rug cleaning. Running River Rug Cleaning knows how to clean the finest rugs the world has made. They give personal care to fine rugs which means they hand wash them one at a time using fresh water- a running river. The finest rugs in the world are cleaned one rug at a time, which is why they continue to be the finest rugs in the world. How to find us ?